Absolutely the best place we could have stayed in Venice. Convenient but quiet location on the doorstep of a little canal bridge and really near some great restaurants. The private double room was comfy and surprisingly opulent-feeling. Max and Ivan were always polite and helpful, and there was always someone at reception to buzz us in and answer any questions. Plus a free breakfast every morning! When we return to the city, we'll definitely be staying here again. DEFINITELY recommend if you are looking for a private room! The room is incredibly nice, and the breakfast delivered to your door in the AM was convenient and delicious. Everyone I met was awesome and friendly, and the location is a 3-minute walk to a ferry station and 10-minute walk to the Rialto. There is no real common area, so for travelers looking for that type of atmosphere, I would say to maybe look elsewhere. If I come back to Venice, I would definitely stay here again! This boutique hostel is a 5 star dream come true. A minute walk from ferry station, amazing rain shower, helpful Max and his brother and breakfast in bed! Don’t miss staying here to get the true Venetian taste of things and that too old school! Quiet and refreshing. The room was pretty and clean with a mini fridge, tv etc and they bring a lovely breakfast to the room everyday. The staff are all really friendly and helpful and overall our stay was absolutely perfect! This was an absolutely amazing place to stay. Staff went above and beyond. Great value, and it’s in Venice itself, not in the mestre. Comfortable, clean, and beautiful. Stayed here for 2 nights and we were so pleased with the hostel. We stayed in the downstairs room which was big and very clean with everything we needed. The air con kept the room really comfortable. The location is fantastic meaning we walked everywhere and am easy walk to and from the train station. Breakfast brought to the room is brilliant. I would definitely recommend for a stay in Venice 5*. This place was great! We showed up late because our flight was delayed (and luggage lost) but we were able to check in no problem. The guy that works the office was very nice and helpful. Our room was very clean and nice. The breakfast in bed was great! The ally way was a bit creepy coming in at night, but after seeing it in the day I was no longer worried. It was a great location, easy to walk everywhere. Food options close by. I felt very safe at the location. I would def recommend to others. Loved this place!! 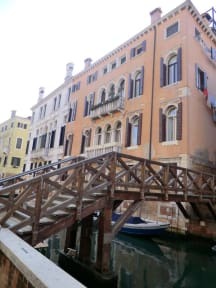 It was quiet and located 5 minutes from the grand canal. The room was clean and smelled wonderful! The room was small but that didn’t matter because we weren’t hanging out in our room. 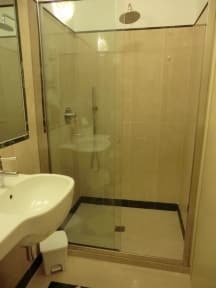 The shower was a rainfall shower and felt sooo luxurious. Breakfast was delivered everyday to the room. The family who owns the place was so kind and helpful. Highly recommended!!! The hotel was very nice and clean, spacious and lovely decoration! the only thing that was missing in my opinion was a proper window with light, further all was amazing! thanks for all!